Carry In or Controlled Entries – Puck carrier brings the puck into the zone on his stick or by making a short, direct pass to a linemate. Dump In – Heavy shot from the neutral zone that goes deep into the offensive zone. The attacking team chases into the zone on the forecheck to recover possession of the puck. Chip & Chase – Puck carrier makes a soft chip around the defenseman or off the boards to get the puck into the zone behind the defense and immediately pursues the puck to regain possession. This usually takes place much higher in the offensive zone than Dump In entries. Failed Entries: Puck carrier fails to get into the offensive zone or past the defending player despite his efforts. This often happens when the defenseman pokes the puck away or quickly forces a turnover just over the blue line. Turnover Entries: After the defending player brings the puck back into his own defensive zone to regroup and go on the offensive attack, the forechecking player (usually a forward) forces a turnover and goes on the attack. 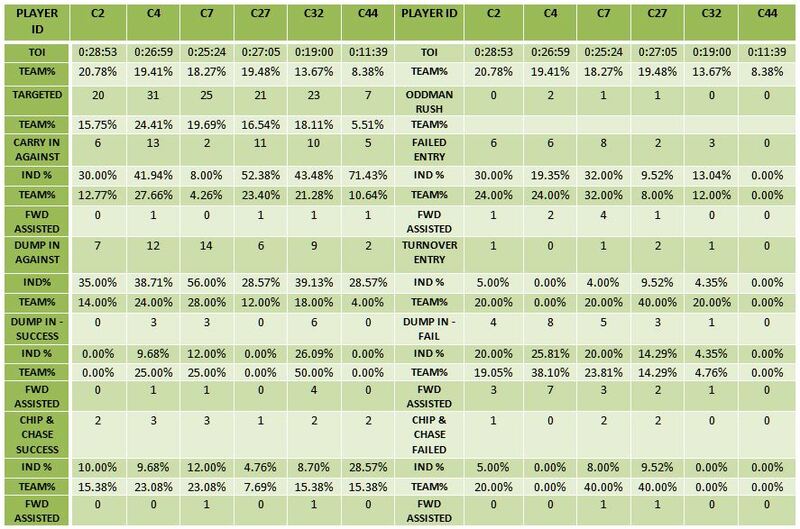 Percentage of entries, targets, failed entries against and the like that is disproportionate to the player’s ice time. 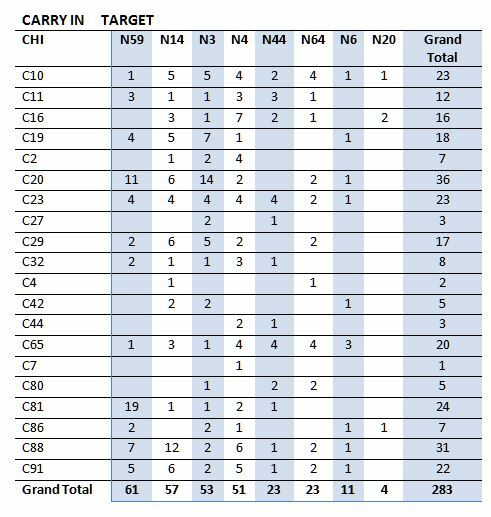 Entries by carry in versus dump in. Failed entries forced by the defenseman. 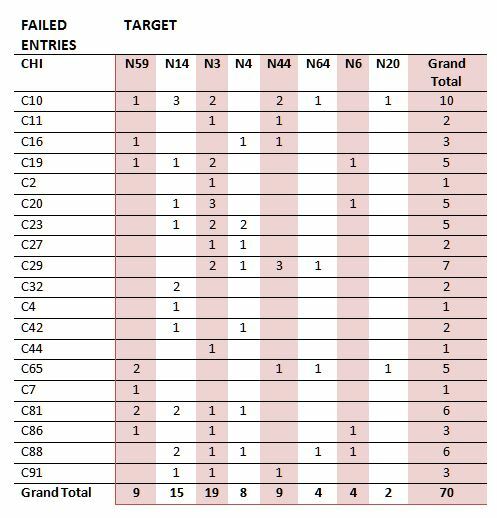 Number of entries where a forward was assisting in defending the entry. 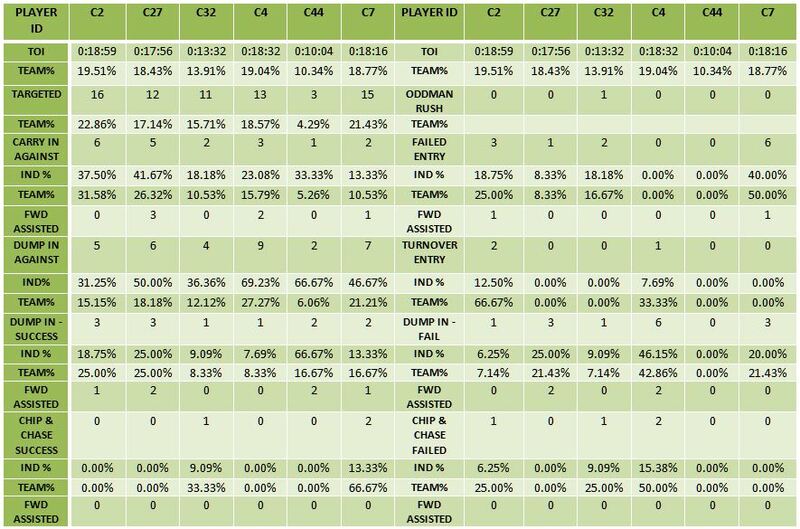 Type of entries that were more or less successful against a particular defenseman. 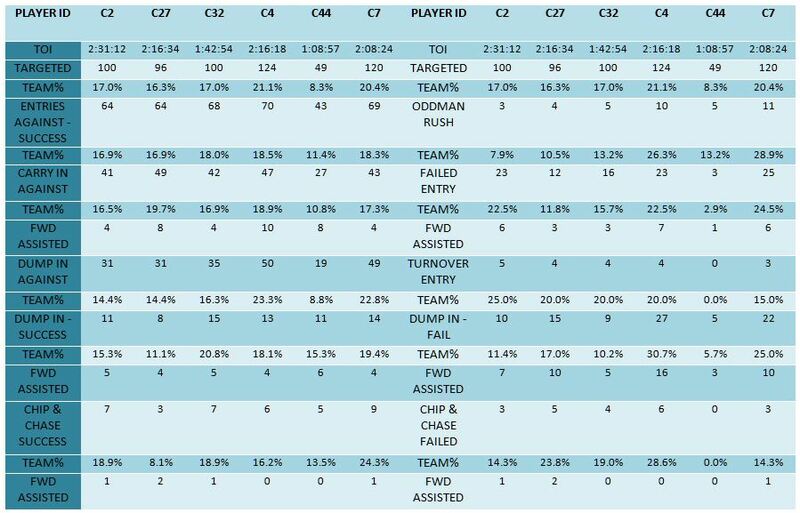 Time on Ice for each defenseman listed is at Even Strength over the course of the series. The percentage listed is based only upon defensemen. Roman Josi (N59), Mattias Ekholm (N14), Seth Jones (N3) and Ryan Ellis (N4) carried the bulk of the load for the Predators. Both Cody Franson (N44) and Victor Bartley (N64), despite appearing in 4 games each, were used sparingly during the series. Anton Volchenkov (N20) played only in Game 1. Shea Weber (N6) played in Game 1 and started Game 2 before leaving with an injury that regrettably kept him out for the entirety of the series. 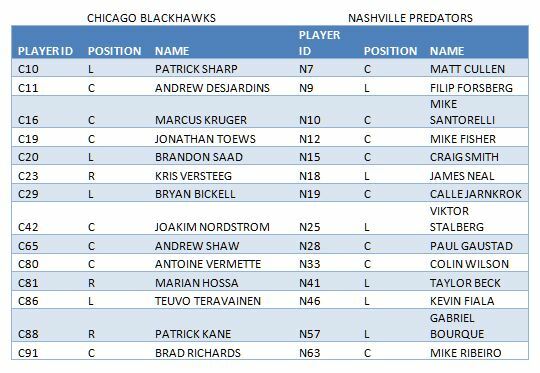 Duncan Keith (C2), Niklas Hjalmarsson (C4), Johnny Oduya (C27) and Brent Seabrook (C7) did the heavy lifting for the Blackhawks, although Michal Rozsival (C32) had a substantial amount of ice time compared to the 5th defenseman for the Predators. Kimmo Timonen (C44) logged the lowest amount of ice time for Chicago. 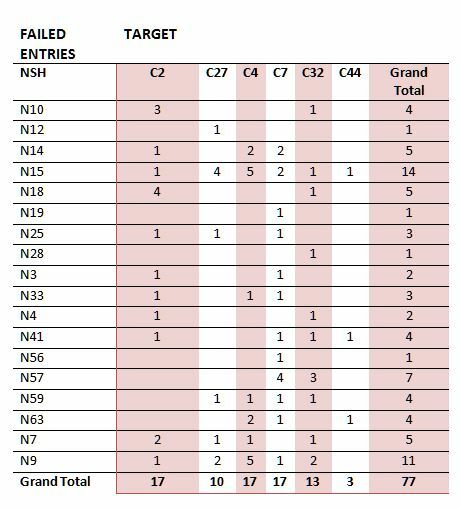 Targets for Nashville tracked closely with time on ice. Josi and Jones had the highest percentage of Dump In entries be successfully retrieved by the attacking team. 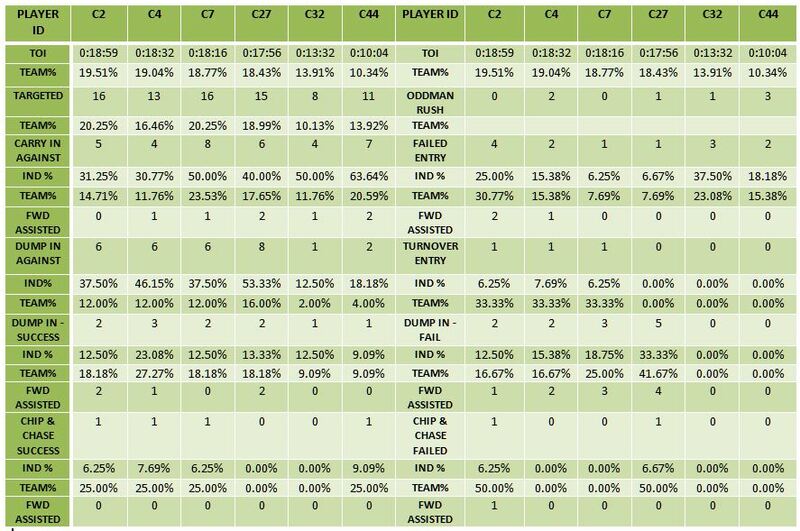 This is logical when you note that many of the Dump In entries against them had a forward in the neutral zone assisting in pressuring the puck carrier. The more players committed to pressuring the entry at the blue line, the less players deeper in the zone to contest the attacking forecheck looking to regain possession of the puck. This is particularly noticeable when you look across the table at the Dump In entries that did not succeed in recovering the puck. 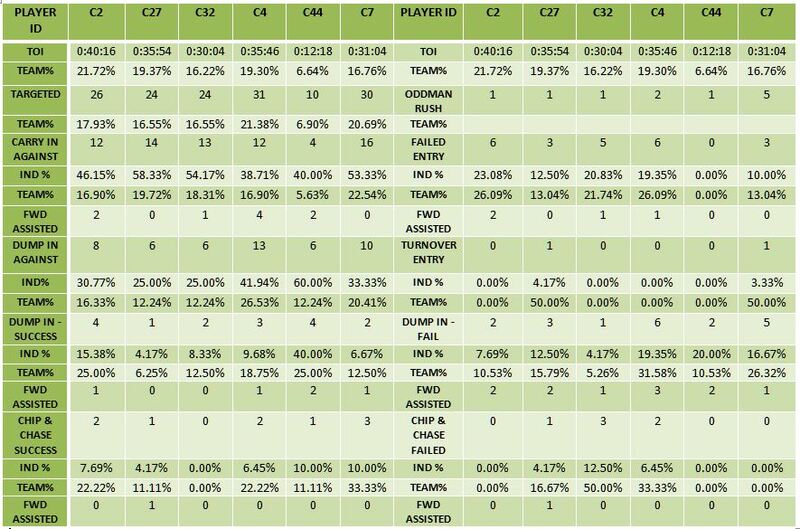 Ryan Ellis had the highest percentage of Dump In entries against him fail and not coincidentally, had the lowest number of forward assists in defending Dump In entries. The head to head table above shows the Failed entries by Chicago against the Nashville defensemen at Even Strength. 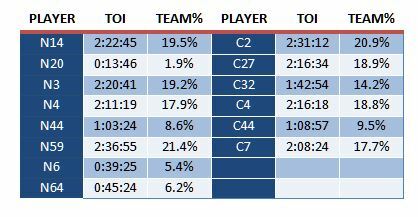 The defensemen are ordered from left to right by highest to lowest Even Strength ice time during the series. Seth Jones is the leader in this department with Mattias Ekholm in second. Carry In entries at Even Strength, shown in the head to head table above, tracked fairly consistently with ice time for the Nashville defensemen. Josi had particular trouble keeping Marian Hossa from carrying the puck into the zone, although he shouldn’t feel bad about it because that is a common problem for most NHL defensemen. Brandon Saad gave Seth Jones the most problems during the series, which again makes sense since the top scoring line will most often be facing the top defensive pairing. Mattias Ekholm had his hands full trying to keep Patrick Kane from carrying the puck in as well (again, common problem). 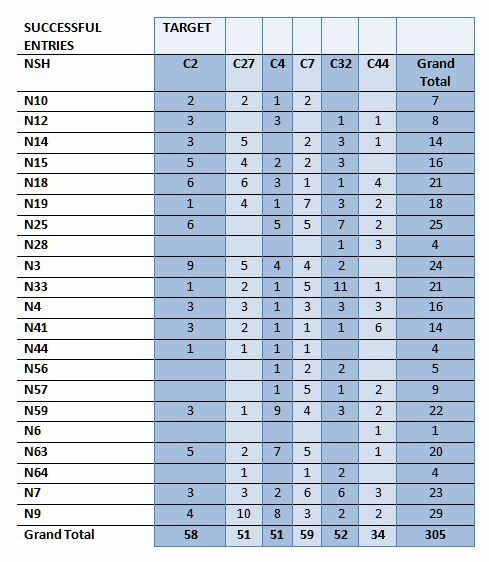 Overall successful entries, be they Carry Ins, Turnovers or successfully retrieved Dump Ins and Chip & Chase entries are shown on the head to head table below. It’s important to note that although the puck simply entering the zone as intended counts as a successful entry for most purposes, for this table, I did not include Dump In or Chip & Chase entries that the attacking team failed to retrieve. Entries again tracked fairly closely with ice time. Michal Rozsival was targeted at a rate disproportionate to his ice; however, given that he played most of the series with Duncan Keith as his defense partner, it’s easy to understand why. Obviously, teams want to avoid facing Keith so they will try to attack what they see as the weaker side of the ice to gain entry into the zone. Hjalmarsson and Seabrook, the two defensemen most aggressive at the blue line for Chicago, had the highest number of Dump Ins against them. 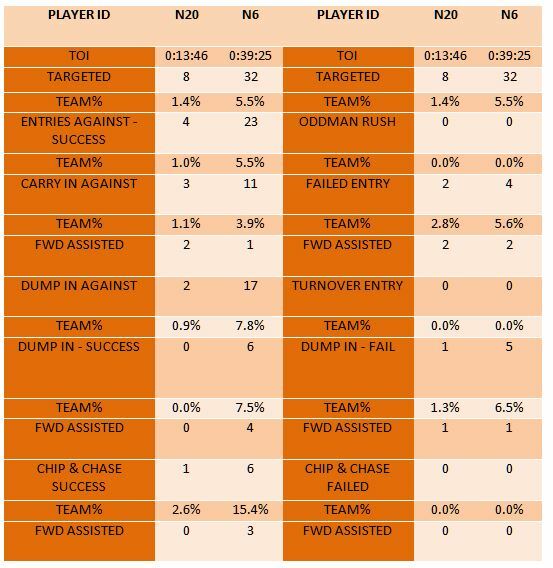 Again, this is not surprising given that they are both know for pressuring the puck carrier with great success. 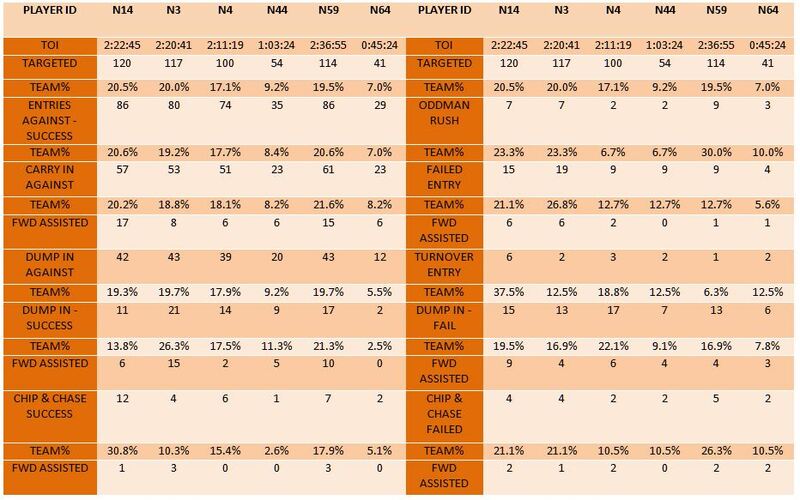 Seabrook had a disproportionate number of Oddman Rushes to defend during the series, likely due to his partner pinching and also because Kimmo Timonen’s foot speed isn’t exactly the same as it used to be. This head to head table shows Failed entries at Even Strength by Nashville against Chicago’s defensemen (who are ordered by ES TOI with left being the highest ice time and right being the lowest). 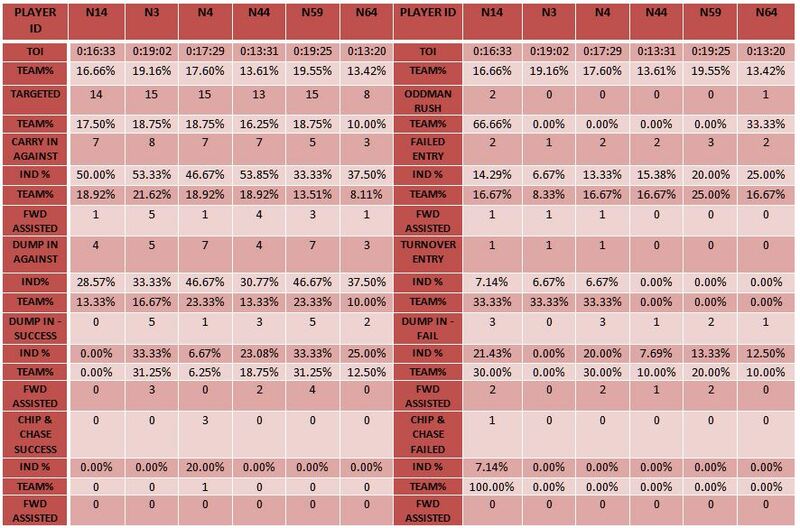 Keith, Hjalmarsson and Seabrook led the way with the highest number of failed entries against them. 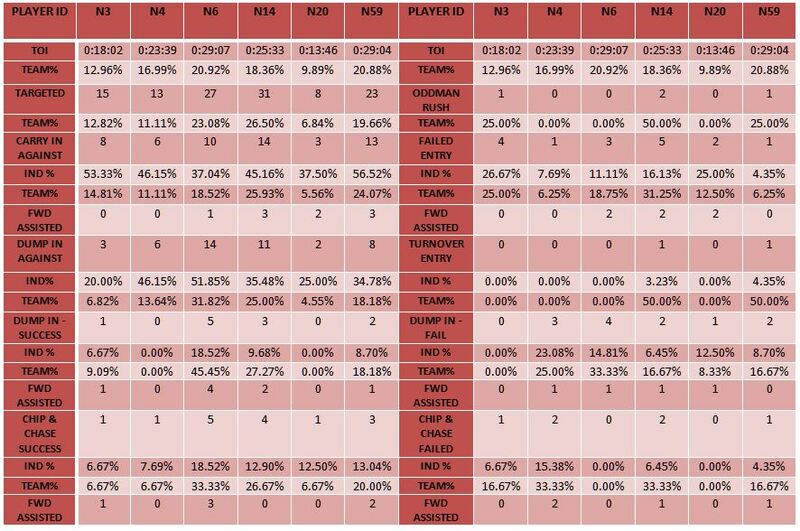 Rozsival, despite having lower ice time than the others, was also quite good at causing carry in attempts to fail. Hjalmarsson and Oduya had their hands full with Filip Forsberg during the series, while Seabrook had problems with Jarnkrok in particular. Keith had his work cut out for him with Nashville’s top scoring lines and also Viktor Stalberg, who seemed to relish every footrace he had with his old teammate. 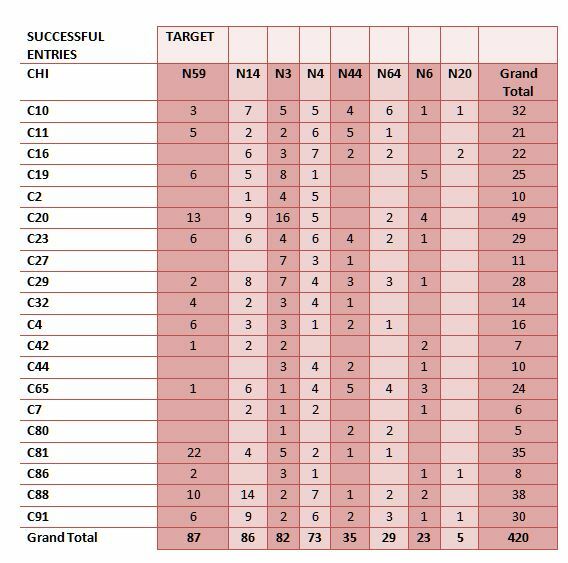 The all-inclusive successful entries table above shows the head to head matchups for the series. 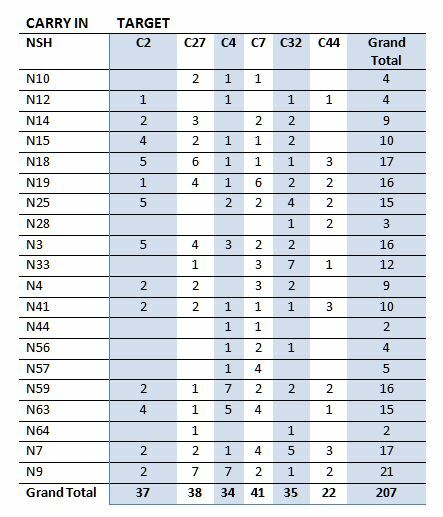 As noted with the Nashville table above, only successfully retrieved Dump Ins and Chip & Chase entries were considered a successful entry for this table along with Carry Ins and Turnovers. In general, this series was fairly well matched in terms of how the defensemen performed in defending against zone entries. The star players gave everyone fits, whether because no one could keep them out of the offensive zone or because they were frustrating forwards by throwing a wrench in the works at the blue line, as expected. If you are interested in seeing how each game shook out in terms of defensive targets, I have included a game by game breakdown for each team below.